Travelling by local transport, we experience the variety that South East Asia has to offer. From the vibrant Thai capital of Bangkok we cross the border to Phnom Penh in Cambodia and continue to Ho Chi Minh City in Vietnam. Along the way we have the chance to explore the ancient temples of Angkor and cruise between floating fishing villages on Lake Tonle Sap. Tour ends after breakfast. If you have time you may wish to take an excursion further afield to the infamous Cu Chi Tunnels. 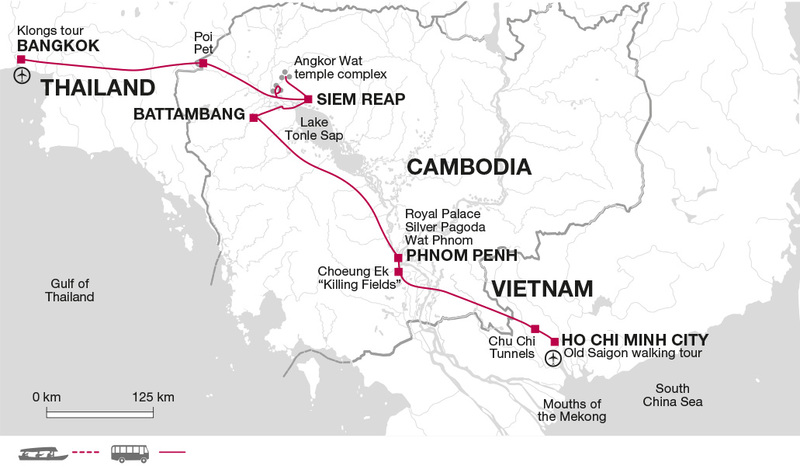 Originally started during the French occupation of the country, the tunnels went on to achieve notoriety during the Vietnam War, when they formed an incredible underground command base for 10,000 Viet Cong troops and were a major part of the Tet Offensive. The prices stated are based on a minimum number of participants (ususally 5-6). Please be aware that the optional excursions can run with fewer people but the price may be higher. Likewise, a slightly reduced price may be applicable where the participation greater. The prices listed are generally only entrance fees and do not include the price of transport to and from the excursion, Your Explore Leader will quote this when you are on tour, as the price for transport will depend on the number of participants. Although entirely voluntary, tipping is a recognized part of life in this region of the world. Some local staff will look to members of the group for personal recognition of particular services provided. In order to make things easier for you, the Tour Leaders may organise a group's tips kitty and if this is the case, they will account for it throughout the tour. Accordingly, you should allow US$ 30. This classic journey through three countries from Bangkok to Ho Chi Minh City has been created for more adventurous travellers who enjoy discovering a destination by travelling overland predominantly using local transport. Some early starts and long journeys can be expected, as well as plenty of free time to explore this rewarding and fascinating region along the way. You will see a lot in a short space of time! If you have more time this tour combines with our Good Morning Vietnam (QVN) tour which covers the length and breadth of Vietnam.